It’s never too early to begin a life-long, preventive dental care program focused on your child’s healthy smile. Start your journey here—at Growing Smiles. 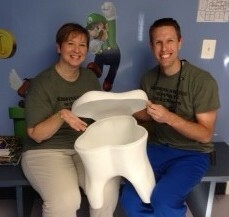 Growing Smiles is a pediatric dental office with locations in Bel Air and White Marsh that treats patients from infancy through their teenage years, including those with special needs. Established by Diana Capobianco, D.D.S. in 2004, Growing Smiles offers features state-of-the-art, child-centered care; comfort care for anxious patients; and a family-friendly treatment area. By educating both patients and parents on the benefits of taking care of their smiles at home, school, and during play, Growing Smiles promotes good oral health habits that will help protect your child’s smile for years to come. A pediatric dentist can provide the focused care and insight necessary to treat the growth and changes that take place in your child’s mouth from infancy to adulthood. As “pediatricians of dentistry,” pediatric dentists are both primary and specialty oral care providers who complete two to three additional years of training and coursework beyond what is required by a four-year dental school curriculum. This specialized program of study, with hands-on experience, prepares them to meet the health care needs of their young patients.